Syracuse New York is a gritty place. This is not a critique. I like gritty cities. Syracuse is the epitome of grit. Poverty abounds, especially in south Syracuse. There have been twenty murders this year--most of them gang or drug related. The roads are a mess throughout the city. Local sports, all minor league teams of various quality, play in small and sometimes run down facilities. Homeless people wonder downtown streets in significant numbers. In spite of its grit, I like Syracuse. I have driven all over the city. The crumbling architecture reveals a city that has been in decline for decades. Once an important hub first for the Erie Canal and then the railway system Syracuse is an old. When I think old I think inaccessible. Wide swaths of Syracuse are a geographical nightmare for a wheelchair user. It is frigid and snowy in the winter--think central New York snow belt. Getting around the city is a real challenge. Most businesses remain inaccessible. Syracuse University where I work is hilly. Hilly as in it is preferable to go well out of your way to avoid the steepest hills. Foremost among the barriers is access to housing and substandard mass transportation in the form lousy bus service. If it were not for the university there is no way I would consider living in Syracuse. When I moved it did not take long to realize virtually all housing was grossly inaccessible. I would estimate less than 5% of housing is accessible. That 5% figure is generous. Old apartment buildings have steps. Old houses have steps and big old homes have been cut up like a pizza pie into inexpensive housing for students. My options were and remain severely limited. The above is a long explanation of why I live about 17 miles east of Syracuse. I saw exactly one accessible rental unit. To describe my rental unit accessible is a big stretch. Regardless, I live in a picturesque town called Cazenovia. The little town is the archetype for small town USA. 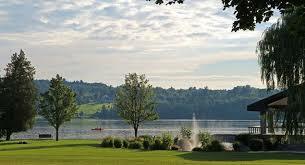 Located on the southern shores of Cazenovia Lake, the town was founded in 1793 by John Lincklaen. He constructed Lorenzo mansion, a gorgeous and largely inaccessible building, that is in mint condition. Cazenovia architecture has not changed much since it was established. The small town teems with history. Cazenovia also teems with steps. 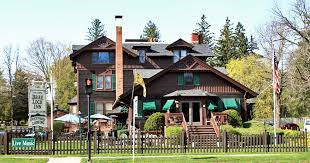 The residents of Cazenovia love their buildings. They love their buildings as they were a century ago. Change, architectural change, is met with overt and subtle animosity. 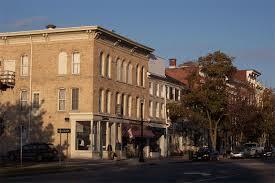 Residents are very proud of the town and the historic buildings that line the main drag, Albany Street. Wheelchair access is severely limited. Indeed when I tell others with a disability where I live they look at me incredulously and ask "Why would you live there?" It is a good question. Cazenovia is many things to its residents. It is without question a beloved town, a great place to raise a family. It is a wealthy little town. It is a very white place to live--97% of residents are white. The town is very conservative. The local newspaper is the Cazenovia Republican. There are several Churches in town. There are many what I would call heavy duty Christians active in every part of town life. Living in Cazenovia is like stepping back in time. In fiercely preserving its architectural heritage, one does not think or even consider wheelchair access as being a variable. Indeed, ramps are an eye sore that would mar the historic buildings--a statement I have heard many times. What I have absorbed in the last year is that outsiders have no say in town activities. When I moved in I naively thought I could lend my expertise to the town and make it more accessible in a way that residents would not object to. I called the town. I sent emails to people I thought would be required to deal with questions over access. The response was silence. The most common reply to email was I acknowledge your interest and concern and will get back to you. No one ever got back to me. I learned the subject matter is taboo. If I raise the issue of access the conversation ends abruptly. In the last year it has become apparent that residents and town officials think wheelchair access is a choice for them and them alone to make. My presence is an imposition. Certain parts of town are visibly accessible and the library is often signled out. I have heard repeatedly "the library has gone out of its way to be accessible. A lot of money was spent. They have electric doors for you". This is done out of the goodness of others hearts. The idea that civil rights and disability rights are one in the same would never cross the minds of town officials. People in the town of Cazenovia are steeped in the charity model of disability. One example should suffice. Each year the flower club or similar town entity decorates the village library entrance. They do a great job. The decorations are tastefully done. I am sure many parents cherish photos of their children out side the library entrance. The decorations also block any wheelchair user from pressing the electric door open button. While checking a book I noted this to a librarian. She had the look of a deer mesmerized by car headlights. Unsure how to reply she stated the entrance looked so good and she would hate to move the decorations because many people worked very hard. Perhaps she said "I could call before I arrive and someone could go outside and press the open the door button". The town has faux access. Little blue wheelchair logos abound in high visibility areas but practical access is absent. This is common. I have no doubt a dedicated group of residents really thought about access. I bet such a group met in person. Decisions were made. I also am sure not a single person making the decisions used a wheelchair or had intimate knowledge of disability. This is why the slogan "nothing about us without us" is used by disability rights activists. I am penning the above because of what I experienced this past weekend in town. I planned to meet a colleague at Dav's diner at noon on Sunday. Not an ideal time as the diner would likely be crowded. Dav's is a typical diner. The food is not bad and it is was a mutually convenient place to meet. I arrived first via the accessible side door. It was crowded but I see a few empty tables. I have been to Dav's a few times. The employees are reasonable people. It is inevitable that a chair will need to be moved away from a table where I will sit and people will need to move so I can get by. Move as in standing up and moving their chair out of the way. Getting to a table is problematic but this is the routine in many restaurants. What was not routine is that for about 5 minutes after I entered employees walked past me many times. After 5 minutes I was getting annoyed. I saw two other people being seated who arrived well after me. At some point it was painfully obvious I was waiting and being ignored to the point it was socially awkward. Finally a young worker came up to me and asked how many. I reply two and she tells me to wait. She walks over to the cash register area, a short conversation ensues between employees.This is odd. She returns and tells me "We just got a huge order. There is going to be a 30 minute wait". Who waits 30 minutes for diner food when it is 30 degrees outside? No one.Moreover there are two empty tables in my line of sight. There is no waiting line. No one except for me is waiting for a table. I had two choices. I can ask pointed questions. Why am I the only person waiting for a table? Where are the mysterious people with a huge order? Why is the wait time so long when tables are open and within sight? Option two was to simply leave without being served. I left because I did not want to argue and considered my meeting of more importance than food. I left and met my colleague at a nearby McDonalds, had coffee and declined to eat bad processed food that would make me physically sick. Did Dav's dinner discriminate against me? You bet they did. The conversation between employees was short and sweet. They concluded it was too much work to remove a chair for me and force seated customers to move. They were busy and did not want to fall behind. They also wanted to be sure they did not lose tips because customers were inconvenienced. Believe me people initially move an inch so I can get by and when it dawns on them they need to stand up and really move they are not happy. Some people get very angry. In short, the worker lied about a "huge order" and created a 30 minute wait they knew no one would ever accept. Can I prove this? Not a chance. What I can state is that I have seen this tactic more than once in a restaurant. What bothers me is not what took place but rather I had no recourse. If I pushed, if accused of lying I would be easily slotted into the bitter cripple stereotype or have a cripple's disposition. I am mad at the world and want everyone to be as miserable as me. I could of course refuse to give them my business in the future. That is not much of a loss. What took place at Dav's was not unusual 30 years ago. I had no civil rights 30 years ago. My civil rights are protected today. What I experienced was a significant civil rights violation. Worse yet, I am sure the employees have no idea they broke the law. This is the very real and ugly side of living in a town that glories in its beauty and is firmly resistant to change.